Soundtrack of your life was a phrase that never carried as much meaning as it did during the 1990s. Generation X was stepping out into the forefront but unsure of what their identity would look like. The music of the decade reflects this uneasiness and shifting tones. What was rad and phat one minute was lame and whack the next. Numerous genres like grunge, west coast hip hop, boy bands, New Jack Swing and coordinated dance songs all had their time to shine in the 1990s. Even the media by which music was being listened to was evolving. In 1990, Napster was an unheard of entity. Having a complete library of music at your fingertips felt like a sci-fi plotline. The vastness in which music was delivered to your earphones late in the decade gave haste to more exploration among its listener. The odd thing was that certain songs still dominated the airwaves and become a household phenomenon even with this increased platform and usage of music media. My parents raised the roof and we did the Macarena as an exercise in P.E. The world was evolving and music was right there with it step for step with increased sampling and computer generated effects. There is a comfort to having a soundtrack for your life. A voice that is speaking to you and most importantly understands you. These songs made their mark on this tumultuous decade and have stood the test of time as quintessentially 1990s music. Here is how the process works. The first round consisted of 64 groups of 90s songs. This is consistent with the group format used in the World Cup. 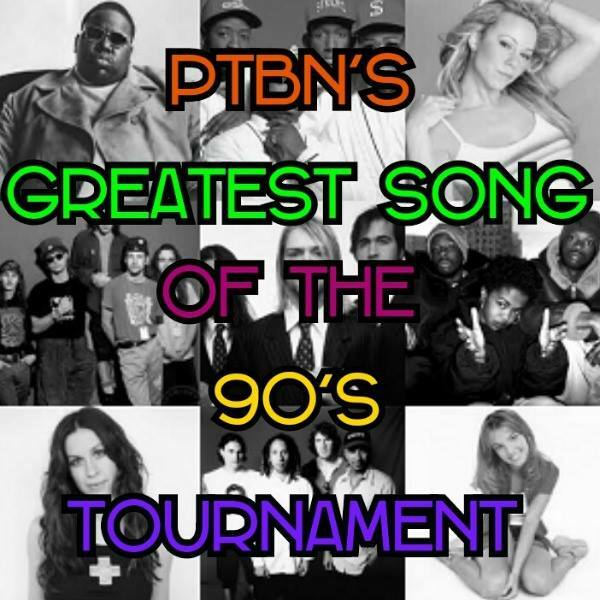 The total number of 90s songs in the entire tournament is 640 and was vetted with PTBN staff members and non-staff music experts. It is possible that an individual’s personal favorite song didn’t make the cut, but we feel confident at PTBN that these 640 songs cross all genres and are representative of the sound of the decade, including criteria across success, longevity and impact on pop culture. 128 songs survived the pool rounds and were ranked and seeded based on percentage of votes received in their pools. The songs were then split off into a giant bracket that includes four separate regions. We’ve completed two rounds in the bracket, and are now in the round of 32. Please cast your votes below!